As it occurs due to genetic disorder or family history of baldness, it may involve certain risks. 1It may occur due to physical and psychological stress. 2It may occur after pregnancy pills. 3It can also occur after regular use of aggressive hair-styling techniques applied on hairs. 4It is a problem due to poor nutrition intake. 5It may be because of rapid weight loss. 6It can also occur due to restrictive diets that is low in carbohydrate & fat. As it highly depend upon factors that are non permanent. Hairs may grow again after baldness in month or two. 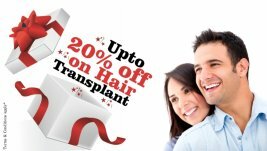 Even if it does not grow many types of treatment and procedures are available all over India that can cure this disease.